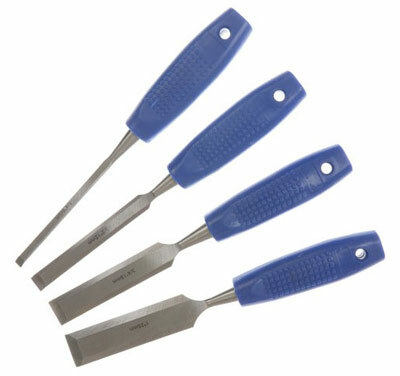 Help and advice on how to sharpen your chisels and plane blades safely and how to use oil stones or diamond stones to keep wood chisels sharp and effective. Sharpening wood chisels and plane blades is almost a forgotten art with all of the honing wheels and modern grinders but there are still those of us who believe that a good chisel should be treated with the utmost respect and sharpened, by hand, to the point where it will cut a cigarette paper with no tearing. Old fashioned? Yes, but a good tradesman knows the real value of sharp tools and the money it saves when you can cut in a door hinge without even using a hammer. Chisels have two blade angles. The shallow, long angle which is usually set to 25°, is called the grinding angle as the chisel is ground down to this angle when first made. The second angle (usually 30°) is called the cutting angle and allows for easier sharpening of the chisel itself. The side edges of a chisel blade are usually beveled also to allow the chisel to cut into the corners of a dovetail joint. Use an oilstone to sharpen your chisels and, having laid a small amount of oil on the stone, place your chisel on at the correct angel. A honing guide can be used for this but these guides do not allow you to sharpen the chisel in a figure of eight pattern very easily. The reason the chisel is usually sharpened in a figure of eight is that this allows you to use the full width of the sharpening stone and you do not wear away a groove up and down the stone. It is important that every part of the chisel edge touches the stone at all times and this will come with practice. You do not need to press hard, just run the chisel round the stone and get used to how the angle feels. Every now and again, run your finger over the back edge of the blade where (if you are getting it right) you should feel a slight metal burr. At this point, turn the chisel over and lay the back flat against the stone. Rub up and down gently a couple of times to remove the burr. Plane blades are sharpened in the same way but, as they are wider (except for rebate plane blades) there is no need to use the figure of eight method. As with everything else in the building trade, practice makes perfect, so just keep trying. Its not rocket science but it is tremendously satisfying when you get a chisel really sharp by hand. 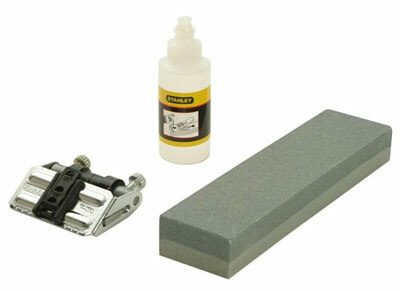 Go to our video section on hand and power tools to watch a couple of videos showing how to sharpen a chisel. Or you can watch the video below.